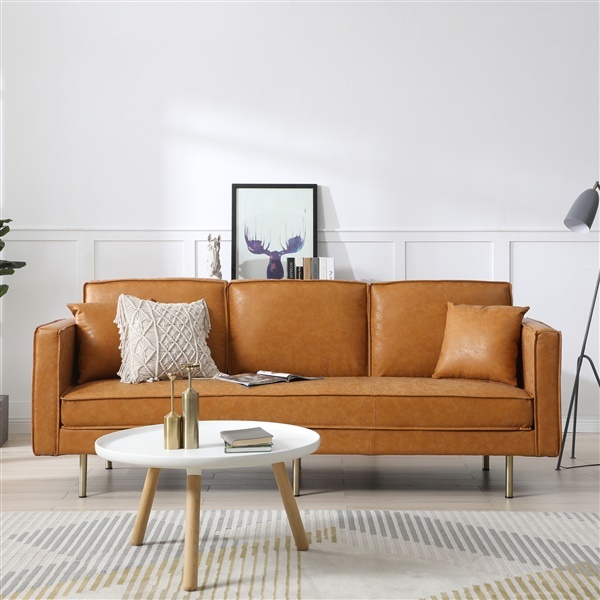 Just about as sleek as seating can be, the Emma Sofa is expertly upholstered in your choice vintage-inspired faux leather hues. 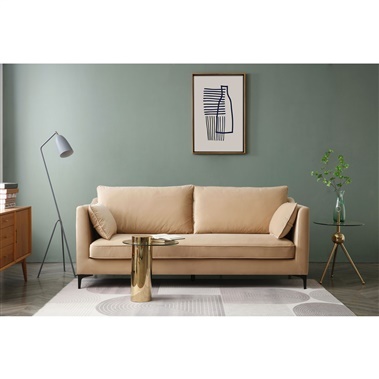 Though streamlined in its design, the Emma Sofa also offers the lush comfort of dense memory foam within its long, lean silhouette, which is supported by simple yet stable cylindrical metal legs finished with just the right amount of sleek gleam. Your choice of rich, vintage-looking faux leather upholstery styles. Generously padded with an added layer of dense memory foam. Slender yet stable cylindrical metal legs with subtle gold finish. Eye-catching piping adds subtle yet elegant detail. Bringing that madmen appeal into my home - super classy with modern elements, love that 1960s flavor it has going on with the upholstery - thank you! This sofa could easily be considered plain except the metal legs totally change up the style and fortunately they are more noticeable in a living room with lots of metallic accents! Beautiful sofa! As an interior designer, I am always looking for new pieces to offer my clients. Inmod has been my go to for years now, and they never disappoint. I purchased this for a client in the tan color and they absolutely loved it. I will definitely be purchasing more of these. Service is always top notch as well. ProsAlways a pleasure working with Inmod. My husband and I originally couldn't agree on a new sofa until we saw this one. Once we saw it we knew it was what we wanted but the next battle was what color! We ended up going with the vintage dark gray and we are super happy with it. Going to continue shopping with Inmod to finish furnishing our home. What color are the legs? In one photo they looked to have more of a gold tone but in another photo they look silver. The legs of this sofa have a gold finish. Loving this sofa - was wondering if you offer fabric samples? Would love to see the fabric before purchasing. It's hard to buy a sofa without sitting on it - how 'dense' is the cushion? We are able to offer swatches of the fabric in the mail, free of charge. You may email your request to [email protected] Please be sure to include the name of the item, the colors you would like to see and your mailing address. The cushions on the Emma Sofa made with firm density foam.